Today’s market is full of visual buyers. Real estate listings are treated like dating profiles so if the first impression buyers see is unattractive, they’re swiping left without a second thought. Do your home justice and put in the attention it needs. When the multiple offers start coming in, you’ll be happy you did the repairs before selling a house. Usually when a buyer has their offer accepted on a property, it is contingent upon an inspection. A buyer inspection is typically paid for out of their own pocket and then they negotiate with the seller for items they want fixed. This is also the time that a buyer can walk if they don’t like the results of their inspection. The best way to get ahead of any surprises is to obtain a Pre-inspection. Yes, this will be at your own cost, however, a small price to pay to save a headache from happening later. While preparing your home for sale, a pre-inspection will give you a starting point of items to repair before selling a house. It will address any safety issues or big ticket items that need mending. Also, attaching a pre-inspection along with your sellers disclosure will bring in only serious offers and put any potential buyers minds at ease that they won’t be blindsided by their own inspection. When we think of home, the feeling of safety definitely comes to mind. This doesn’t mean you have to baby proof a house you’re trying to sell, but there are several areas where safety features are common and even legally required. 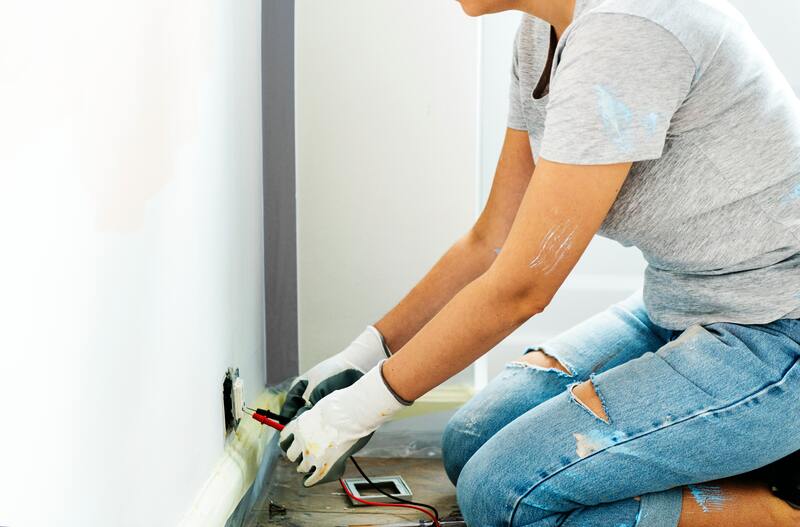 When selling a house that needs repairs, obvious safety concerns should be fixed, such as exposed wires, non functioning door and window locks, and smoke detectors tested. Your pre-inspection will also point out safety concerns that may not have been immediately noticeable. These types of items include chimneys being swept clean, the hot water heater being set to an appropriate temperature, and large appliances having anti-tip brackets installed. This is the very first thing potential buyers are going to see. Think of an interview or a first date. You don’t get a second chance to make a first impression. Which home would you attend an open house for? The one with the flowers around the mailbox and farmhouse porch swing or the house with a broken refrigerator at the curb and little shop of horrors style bushes? The interior is not the only place that needs some repairs before selling a house. Make sure landscaping looks full, even if it just means filling in fresh mulch. Along with tree and hedge trimming, take a look at the driveway. A fresh coat of sealant will help to cover old stains and light cracks from settling. Throw a wreath on the door with a welcome sign and your house will get favorited by potential buyers. Don’t discount the magnitude that the small details bring to the overall appearance. How many times when you were looking at this house did you flip the light switches? More than you even realize probably. Make sure that all of your lights have bulbs. Simple enough, right? The other unsung hero when sprucing up the house is caulk. So cheap and what a difference! Pull out that old, peeling, black spotted caulk around the tub, toilet, windows, and even the baseboards and squeeze a few new tubes. Will the buyers walk in and leave talking about the fresh caulk? Unfortunately, no, but they WILL if you leave the old stuff for them to see. We’ve all seen the Febreeze commercials that remind us what we become nose blind to. Smell is something we can’t see in pictures but it will definitely leave a lasting impression to all who enter your home. How terrible to put in all that effort to market successfully, just for your house to be remembered as the one that smells like pet odor, smoke, or your favorite patchouli incense. Purifying the house doesn’t have to break the bank. In fact, this is another instance where a couple hundred dollars investment adds thousands to your sale price. Throw on a fresh coat of paint, shampoo the carpets and get a professional deep clean. This makes the house not only smell great but makes the appearance so much more attractive and inviting. You wouldn’t enter a beauty pageant and not at least take a shower. Ready to get started? Hire an experienced real estate agent and get a realistic idea of how much your home will sell for with and without the repairs.